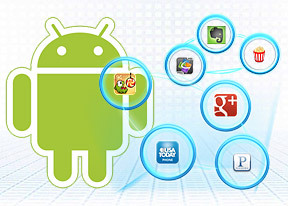 Android is a vastly customizable mobile operating system at its core. You can tweak almost anything about it, from custom wallpaper and icons, through kernel and ROM flashing, all the way to fiddling with CPU voltage to squeeze every bit of horsepower. We'll start by focusing on how to make the Android user interface your own and looking at the various newbie-friendly options available. Frankly, they should be more than enough for you to start your journey. We've been over the Android user interface multiple times, so we're not going to focus on it that much. In fact, you should've already read a review of the smartphone you've got so this guide will have something to build on. We'll also assume that you already have a Google account and can find your way around the Play Store. Custom launchers change the behavior and looks of the Android homescreen. But some custom launchers will also affect the app drawer too. Launchers are the easiest way to give Android a totally different look and feel. They don't require rooting or any other tiresome preparations, they are simple .apk files to download and install just like regular apps. There are literally thousands of custom launchers out there. There are even ones that will put on a Windows Phone or an iPhone disguise; that's just how customizable Android could be. You are not limited to single one either - you can grab several different and exchange them as you see fit. Here are just a few of our favorite custom launchers. The ADW Launcher is one of the most popular custom launchers out there. So popular in fact, that it was the default launcher in the popular Cyanogen ROM prior to Ice Cream Sandwich. It has since received plenty of improvements and new features. Not to mention that it's probably the most compatible of them all, featuring support for Android 1.6 through 4.1. Available in both free and paid versions, the ADW Launcher is the go-to place for tweaking every little aspect of your Android desktop. The settings for the homescreen animations alone are enough to make your head spin. The launcher offers you to set up different themes, which are also available in the Play Store. One of the more interesting features in the ADW Launcher is its support for Gestures. They are user-configurable and can really speed up trivial tasks. You can configure an action for swipe up or down, two-finger swipe up or down and pinch zoom. The differences to the paid version of the app are few, but substantial. Opening your wallet for the paid version will get you backup and restore features for your existing settings. This way you can switch between your favorite configurations quickly and painlessly. You can also resize widgets, even if they don't support it, paginate the docked icons and so much more. To get a better idea of what ADW Launcher is all about, check out its promo video below. Built to outperform the stock Ice Cream Sandwich launcher, the Nova Launcher has become a favorite homescreen replacement for many Android-heads out there. Unlike the ADW, the Nova Launcher only supports Android 4.0 and up. What that means is it's built with one thing in mind - speed. Everything from the homescreen scrolling, to the app drawer opening and the overall feel of the app is blazing fast. That's not to say, however, that it is not feature-rich. It knows most of the tricks of the ADW launcher, but puts its own spin on them. The Nova Launcher is developed to resemble the custom Android 4.0 launcher. So, if you want to get rid of Samung's TouchWiz or LG's Optimus UI in favor of a neat, simple and blazing-fast custom launcher, you should look no further. Naturally, there's a paid version available with more bells and whistles. One of them is the ability to create app drawer groups and bring order to a multitude of apps. Other perks include count icons for missed calls, unread texts and emails, gestures and additional scroll effects among others. Another impressive homescreen replacement app is the Go Launcher EX, developed by the highly acclaimed Go Launcher EX team, which has a lot of great Play Store apps to choose from. This particular homescreen launcher looks the part and is totally free. The team of devs has also done a lot of custom widgets to go with the launcher (they are downloaded separately though) and we really like their minimalist approach. There's a very solid community behind the project as well. You can download numerous themes and icon sets from around the web to make your smartphone look exactly the way you want it. Android is so customizable that you could easily transform it into something completely different. How different? How about an entirely different OS? Yes, you can make your Android smartphone look like a Windows Phone in a heartbeat. There are a few custom launchers out there that can do the job, but our favorite has to be Launcher 7. It's lightweight and performs reasonably well considering the massive task of completely transforming the Android desktop experience. In true Windows Phone 7 fashion you can set up the tiles the way you want them; they are live, too, to perfectly mimic the WP experience. On top of that, the launcher also reworks the app drawer so if you like the minimalist look and feel of Microsoft's mobile OS, the Launcher 7 app is the way to go. Like the rest of the user interface, the Android lockscreen can also be easily replaced by simply getting an alternative lockscreen app from the Play store. A cool and easy to use app is the WidgetLocker lockscreen. It's an all-round lockscreen replacement that can virtually transform the lockscreen of your trusty droid to suit your needs better. It's easy to set up a new lockscreen right within the app. You simply drag and drop the differently styled sliders, Android widgets and even app shortcuts onto the canvas and literally build your lockscreen from the ground up. Sliders, which date back to Android Gingerbread, can have different styles (Ice Cream Sandwich, HTC Sense, Motorola or even iPhone-like). The app works very well with the previously mentioned ADW Launcher as portions of the app are based on it. From the developers of the GO Launcher EX comes this really sleek looking custom lockscreen. Just like its homescreen brethren, Go Locker comes with a cool array of features including wide theme support. Naturally, the app works really well with the Go Launcher EX and just like it is very stable and is compatible with older versions of Android, 2.0 and up. You can setup up to 9 app shortcuts and make your lockscreen unrecognizable, as you can see in the screenshots above. iOS users have been enjoying a weather forecast widget in their notification drawer, but Android user's don't need to feel jealous about it. There's this app called Notification Weather, which does what it says on the box. It puts a weather notification in the notification drawer showing you either an expanded, 4-day forecast, or just today's forecast, which doesn't take as much space. You can set a custom default location, or have the app detect it automatically, as well as choose a service provider (currently only Yahoo Weather and Open Weather Map are supported). It all sounds and looks pretty great, but there's one substantial drawback - the app runs only on Android 4.1 Jelly Bean and up. So in case you're Android smartphone isn't among the handful of devices running Android 4.1 Jelly Bean, you're out of luck. Samsung, LG, HTC and other smartphone manufacturers with their own home-brewed custom launchers have had toggles for core functions in the notification area for a while now. Switches for Wi-Fi, Bluetooth and GPS come in handy, as you don't have to go all the way to the settings menu just to switch on or off some of your smartphone's radios. Instead, you open the notification drawer and tap on a button. Simple as that. However, those of you who have purchased a Nexus device, for example, running stock Android are out of luck. Granted, in the latest release of Android 4.2 Jelly Bean, Google introduced a quick settings menu, but it just acts like a plunge-board to the settings menu. Not ideal. Running on Android 2.3 Gingerbread and up, the app provides you with a set of actions that you can put on either as a widget on your homescreen or an additional bar in your notification area drawer. You can set up which actions you'd like to display, and there's a wide range to choose from (3G, Wi-Fi, Bluetooth, Screen brightness or even Flashlight). Power Toggles is a must-have for those of you who don't have notification area toggles out of the box.